When your cat refuses to eat, you might wonder how on earth you can make your skinny cat gain weight. Truth is, cats are stubborn, but they all crave a good meal. If your skinny cat needs to gain weight, read our top ten tips for adding healthy weight to your cat! If you truly wish to add weight on a skinny cat, you’ll need to first rule out any potential health concerns. Why? 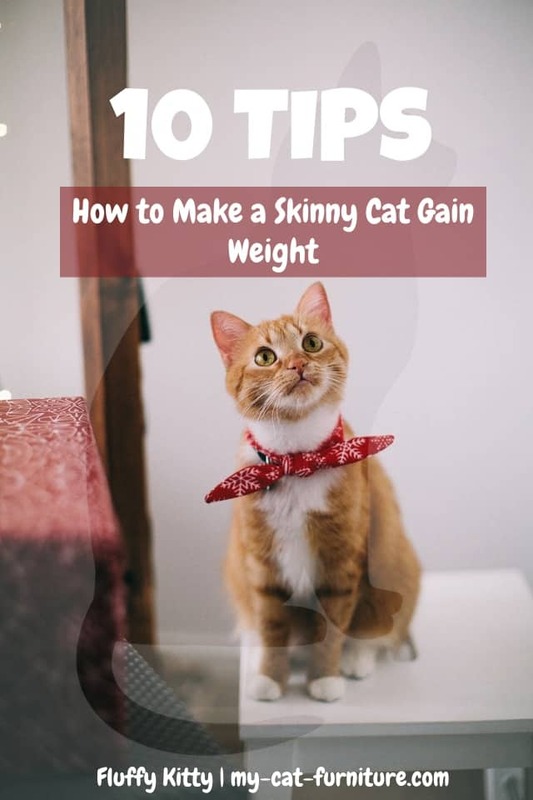 Because even if you do everything to help your skinny cat gain weight, nothing will help if the cause of weight loss/skinniness is due to an invisible and deteriorating health issue. If your skinny cat is losing weight fast and looks sickly, please take your cat to the vet as soon as possible. Cats need a blend of healthy meat protein, vitamins, minerals, and fats. Your skinny cat will need a proper, nutritious diet in order to gain weight. Don’t expect a skinny cat to magically gain weight by feeding the same boring dry kibble over and over again. Invest a little more money into a high-quality cat food your cat can’t wait to devour. You might spend an extra few bucks a month, but by doing so you could save hundreds or thousands of dollars in future vet bills. The health and well-being of cats always include a delicious, nutritious diet. Getting cats to eat more might require an adjustment to their regular eating schedule. Cats tend to like to eat smaller portions throughout the day, so consider leaving a lump of food out across the day. If you have a full schedule and cannot commit to physically feeding your cat, say 3x a day, then consider investing in an automatic cat feeder that will make sure your cat gets fed on time throughout the day. Always check on the back of the cat food bag for proportion recommendations and adjust as necessary. In addition to increasing proportions, you can help make a skinny cat gain weight by supplementing your cat’s regular diet with a spoonful of high-calorie gel. We recommend buying Tomlyn’s High-Calorie Nutritional Gel. It is a veterinarian-formulated high-calorie nutritional supplement aimed at adding another source of energy to your cat’s diet. It’s tasty for cats and it helps them to gain weight. Plus, it’s super affordable and worth a try. If you only feed your cat a dry kibble diet, chances are s/he is severely dehydrated. Even if they drink plenty from their water bowl, dry cat food is VERY dry and your cat’s health often suffers for it. Always provide a fresh bowl of CLEAN, COOL water at all times. We recommend, as a minimum, to change your cat’s water (and clean/scrub the bowl free of bacteria) twice a day. More is better! With that being said, you can help your skinny cat gain weight by providing a mixture of both dry and wet cat food. Wet cat food packs a lot of moisture in a meal with the same great taste and nutrition as their dry counterparts. 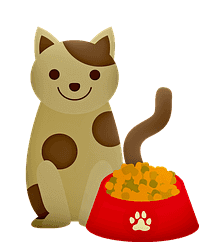 If your cat seems uninterested in its dry cat food, add and mix some wet cat food in with it. I bet your cat won’t resist the temptation. At least Yoda can’t and now whenever we are out of wet food and he must eat dry, he makes sure to show his discontent! Treats are not just handy for well-behaved cats! Treats are a great way to boost your cat’s appetite, which will help him to eat more and thus gain more weight. Cat treats come in all types, shapes, and flavors. Consider your cat’s lifestyle and personal tastes when buying treats. Provide a few throughout the day, or as a bonus snack whenever your cat eats well. Is your cat sleeping all day and being lazy? Cats who are active burn more energy, which they’ll need to replenish via their mealtimes. You might think that more playtime will contradict helping your skinny cat add some weight, but the result is quite the opposite. Active play requires both you and your cat. Try to incorporate a minimum of 15 minutes of active play per day. It is also wise to feed your cat directly after playtime, to encourage your cat to eat the way they normally would in the wild (active hunting + feeding time). Yoda is always hungrier after a session of active play versus when he has been sleeping all day. Make sure to speak to your vet before administering any tablets to your cat, but we recommend to get your skinny cat checked for worms periodically. You usually can’t obtain a deworming tablet outside of the vet anyway, but don’t ever try to give medication to your cat without a vet’s approval. A deworming tablet can rid your cat of any potential parasites which commonly cause cats to lose weight and/or prevent skinny cats from gaining weight. Weight loss in cats can be life-threatening. Even if your skinny cat isn’t losing weight, not gaining any weight typically isn’t a good sign either. Especially if you have already tried all these ten tips without positive results. 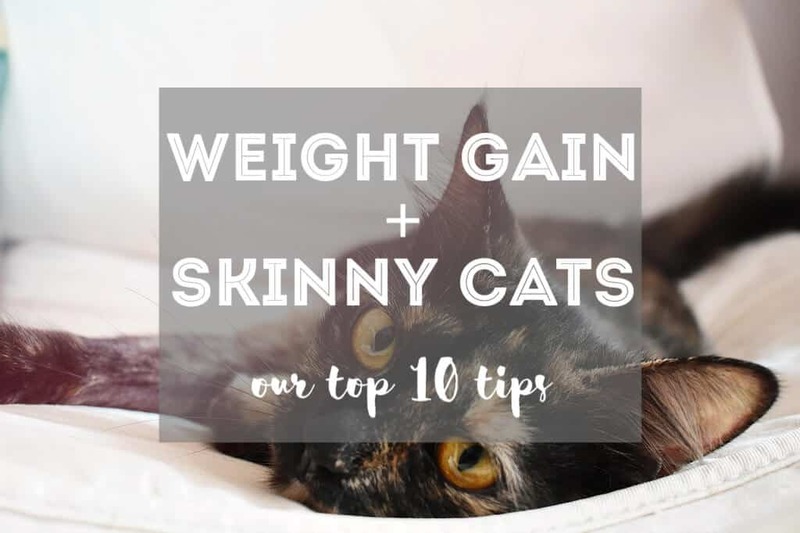 We are confident however that these tips will help your skinny cat gain weight (once you rule out any underlying health issues, worms, etc.). If in doubt of your cat’s health or weight situation, contact a vet. They will be best equipped to provide you with explanations, recommendations, and more. Did we leave anything out? 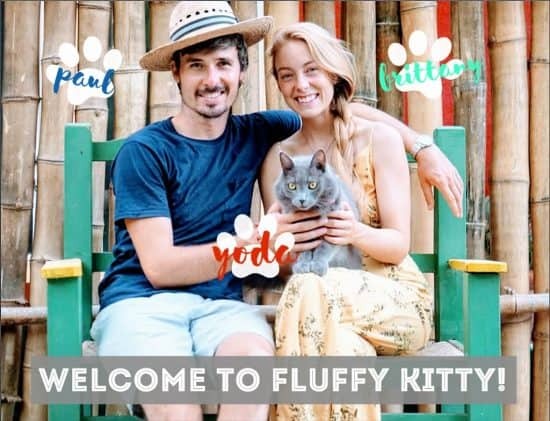 Let us know your tips for making skinny cats gain weight in the comments below. We’d love to update our content with your suggestions!